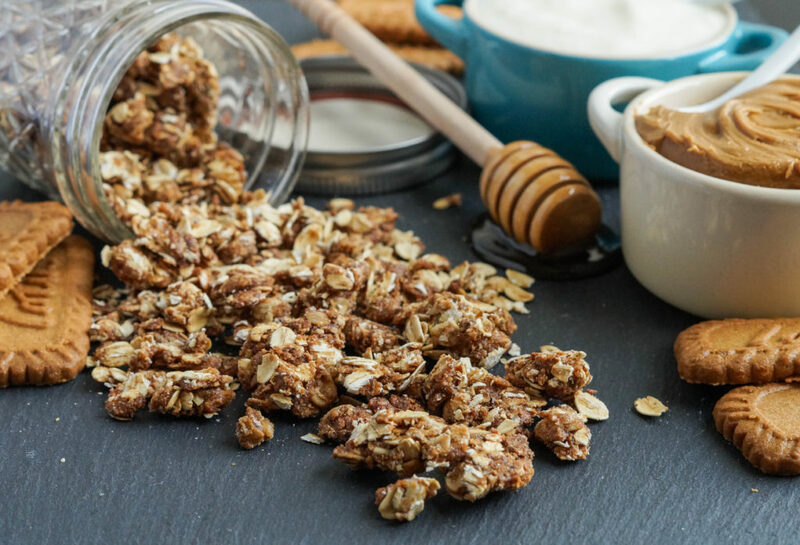 Secret Recipe Club time again and I’m sharing a recipe for Cookie Butter Granola! For those who haven’t seen my previous Secret Recipe Club posts, this club includes three group of bloggers who are assigned a different blog each month and secretly make a recipe to post on their specified Monday reveal day. I look forward to my assignment email every month and discovering new blogs. It is also fun to see what someone chooses from your blog. This month I was assigned to Heather’s blog- Join Us, Pull up a Chair. Heather enjoys cooking and baking with her family. She started writing as a way to organize and share all the recipes she had been collecting from magazines and other sources. She also works during the day in Marketing and as an independent consultant for dermatological-based skincare products. She has quite the assortment of recipes to choose from- bakers especially will enjoy the variety of cakes, cookies, and bars. I decided on her Cookie Butter Granola, but also pinned the following for later: Mac and Cheese Stuffed Tomatoes, Coconut Almond Granola, Strawberry Honey Butter, Hoisin Glazed Meatballs, Cookie Dough Dip, Cheddar Bay Biscuits, Brown Butter Cookie Bars, Strawberry Vanilla Chia Muffins, and Strawberry Pecan Chicken Salad. This recipe includes two firsts for me- my first time making homemade granola and my first time trying cookie butter. I really don’t know why it took me so long to make granola. It is so easy to put together with very little prep work. 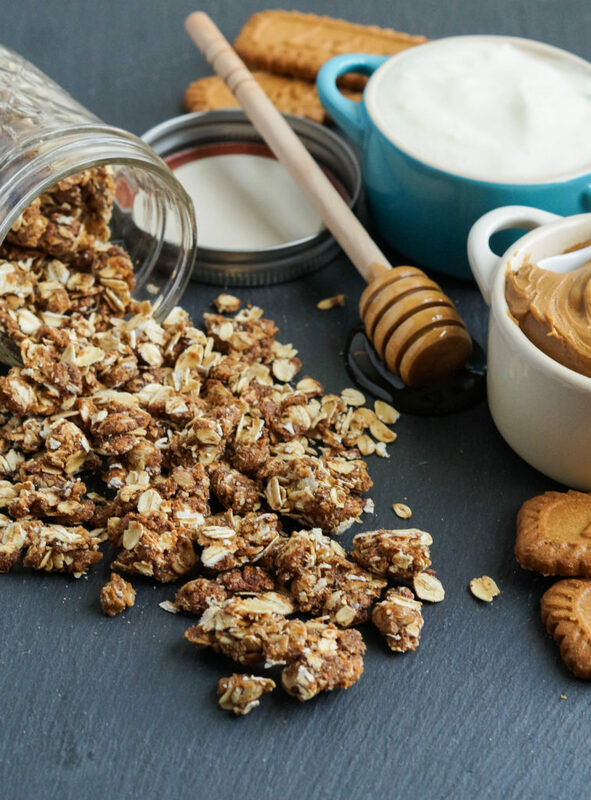 For Cookie Butter Granola, oats are combined with wheat germ, flaxseed, cinnamon, and brown sugar before being coated in melted cookie butter and honey. It may not be the most healthy type of granola out there with three sources of sugar, but I’m choosing to focus on the oats, wheat germ, and flaxseed. I absolutely love the flavor, particularly the almost caramelization quality that the cookie butter provides. Cookie Butter is a spread made from ground Belgian Speculoos cookies. To be honest, I hadn’t really cared to try cookie butter until now, but am so glad I did. When I was younger, I wasn’t a fan of the flavor of Speculoos cookies (known as Spekulatius where I lived in western Germany), so cookie butter wasn’t really on my radar when it was first introduced to the United States in 2011 and eventually became a huge hit in Trader Joe’s. I have since gotten over my incredibly picky tastes and love the slightly spiced, caramelized cookies. It is similar to a lightened version of gingerbread (and like gingerbread, these cookies are popular in Belgium, the Netherlands, and western Germany during the Christmas season). With its popularity, you can now find the Lotus Biscoff brand of cookie butter in the peanut butter section of many grocery stores in the USA. You can also find it on Amazon (for a higher price): Biscoff Cookie Butter Spread. I am now looking up other ways to use up the rest of the jar, if I can stop myself from just using it as a dip for pretzels (it is also great spread over toast, waffles, and pancakes or with apples). Preheat oven to 300 degrees F and line a rimmed baking sheet with parchment paper. On a large bowl, toss together the oats, wheat germ, flaxseed, brown sugar, salt, and cinnamon. In a small bowl, combine the honey and cookie butter. Microwave until heated and thinned in consistency, about 45 seconds. Stir in the vanilla extract and immediately pour over the oat mixture. Toss together until well coated. Spread in a single layer over the parchment lined baking sheet and bake for 15 minutes. Stir and fold over the granola and continue to bake until dried, another 15 minutes. Allow to cool to room temperature before transferring to an airtight container. This is something I would like to stuff my face with after going to the gym! (Okay, before, too). Thanks for the intro to cookie butter! I looooooooooooove cookie butter – I know it as speculoos spread. So delicious and what a fab idea to use in granola! Simple ingredients and looks delicious. My wife would want to snack on this all day! 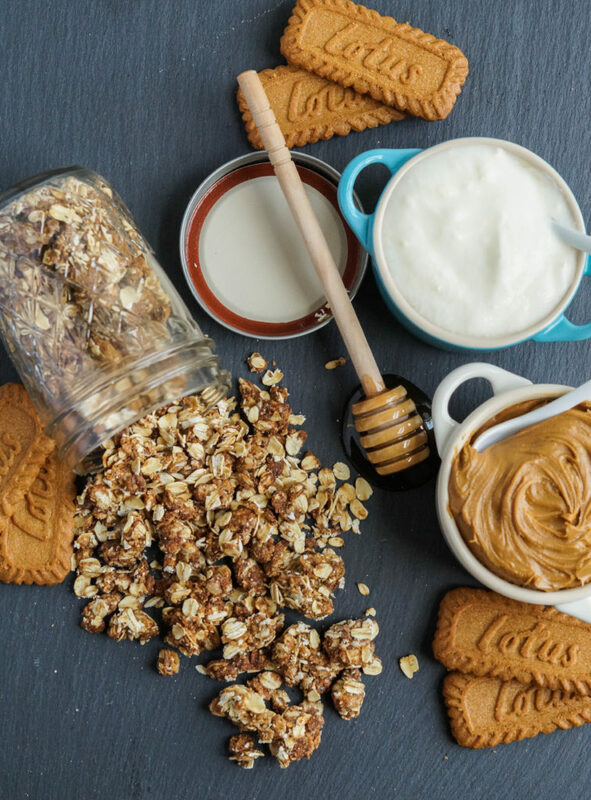 Love all the healthy ingredients in your granola then a little fun with the cookie butter. OMG!! That’s awesome!! I love cookie butter but I never thought to have it mixed in my granola. Looks delicious! I’m still really new to cookie butter but I absolutely love it. This recipe is definitely getting saved to make because I know I need it in my life. There’s definitely something about granola making that’s eluded me, too. But I definitely want and need to make my own. Also, I’ve never had cookie butter either! Love your photos. This granola recipe looks wonderful. I’m not the biggest fan of cookie butter (mostly because I know I’ll eat the whole jar if it’s near me) but this sounds like a great, not too sweet treat. Wonderful SRC post.